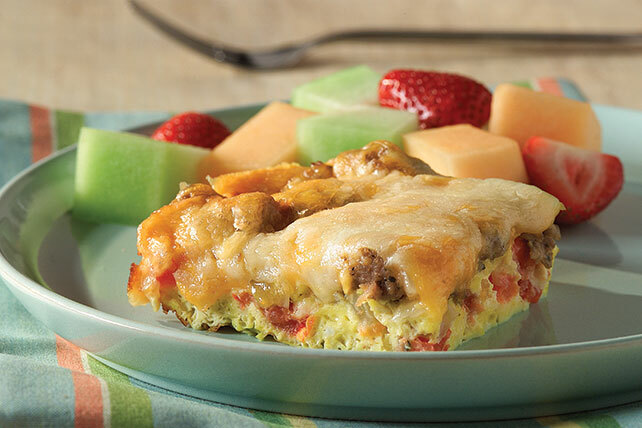 A blend of Cheddar and Monterey Jack cheeses, sautéed onions and skillet-browned pork sausage make this cheesy egg bake a hit at the brunch table. Beat eggs and sour cream with whisk until blended. Pour into 13x9-inch baking dish sprayed with cooking spray. Bake 10 min. or until egg mixture is softly set. Meanwhile, cook sausage, mushrooms and onions in large skillet on medium heat 6 to 8 min. or until sausage is done, stirring occasionally; drain. Serve this delicious entrée with a fresh fruit salad.